Kingmax teases the UI-05, a new flash drive that claims to be world's first transparent USB stick thanks to a chip packaged with clear glass above so you can see the inner flash die. Unfortunately, there's no word about the performance of this stick, the press release doesn't even mention whether it's USB 2.0 or 3.0. 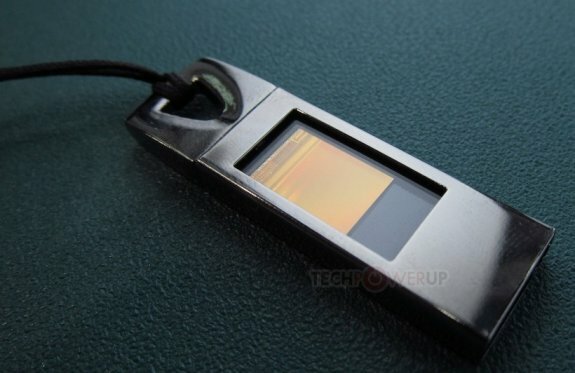 Computex 2012 (6/5~6/9) has just ended, world renowned memory manufacturer KINGMAX not only launched a series of industrial products and SSD, but also exhibited the world 1st transparent COB(Chip-on-Board) type USB flash drive. Different from other USB flash drives, the transparent flash drive, UI-05, has chip packaged by clear glass above; the inner flash die and wire-bonding structure is clear to see, and the blue LED light also makes convenient to indicate working status while using it. KINGMAX UI-05 transparent USB flash drive includes capacity of 4GB/8GB/16GB/32GB. By adopting KINGMAX’s owned IMLCC package technology, UI-05 is the world 1st transparent USB flash drive and owns qualities such as tiny size, high reliability, and high yield rate and so on. UI-05’s revealing circuit structure gives consumer a whole new experience, and expresses an extraordinary appearance of fashion, stylishness and high-tech touch. The streamlined look is futuristic, and the metal housing gives secured protection; the end of product equipped with LED, emitting blue light to make it even cooler. UI-05 flash drive meets RoHS regulations (Restriction of hazardous substances in electronic and electrical and electronic equipment), CE, FCC and BSMI requirements. All KINGMAX products follow strict quality standards and have been 100% tested under strict quality control system to ensure the highest quality before shipping. Moreover, the KINGMAX products are backed up with warranty and global customer service to guarantee most satisfactory user experiences.